FierceTelecom – What is 400ZR? https://www.oiforum.com/wp-content/uploads/OIF_Logo_Color-300x161.png 0 0 Leah Wilkinson https://www.oiforum.com/wp-content/uploads/OIF_Logo_Color-300x161.png Leah Wilkinson2019-03-19 10:13:162019-03-19 10:13:16FierceTelecom - What is 400ZR? The OIF and the Ethernet Alliance hosted interop and technology demonstrations on the show floor this week at OFC 2019 in San Diego. The activities at the two booths overlapped with a fiber connection across the show floor, via which a 400 Gigabit Ethernet (400GbE) transmission generated via Flex Ethernet based on OIF’s FlexE 2.0 Implementation Agreement became part of the Ethernet Alliance’s 400GbE interop. Microsoft, which not too long ago was facing irrelevance, is successfully riding the cloud to reestablish itself and brighten it prospects. SAN DIEGO – March 5, 2019 – Industry leading organizations, OIF and the Ethernet Alliance, today announced an interoperating 400 Gbps Ethernet (400 GbE) network demonstration at OFC in San Diego, CA, March 5-7, 2019. The joint demonstration will feature Flex Ethernet (FlexE) traffic sent over three bonded and subrated 100 GbE interfaces streaming over the Ethernet Alliance 400 GbE network with interconnection between the OIF and Ethernet Alliance booths on the show floor. The demonstration is designed to showcase the Ethernet Alliance’s IEEE 802.3bs 400 Gbps network and OIF’s FlexE 2.0 Implementation Agreement (IA). Happening in booth #4749, the Ethernet Alliance’s OFC 2019 demo incorporates equipment and solutions from 21 different companies: Amphenol Corporation; Anritsu Corporation; Arista Networks, Inc.; Cisco; Credo Semiconductor, Inc.; EXFO, Inc.; Finisar; Intel Corporation; Ixia / Keysight Technologies, Inc.; Juniper Networks, Inc.; Lumentum Holdings Inc.; Nexans S.A.; Panduit Corp.; Source Photonics Inc.; Spectra7 Microsystems Ltd.; Spirent Communications; TE Connectivity Ltd.; Tektronix, Inc.; Teledyne LeCroy, Inc.; VIAVI Solutions, Inc. and Xilinx, Inc.
Optical Internetworking Forum (OIF) is where the optical networking industry’s interoperability work gets done. Celebrating 20 years of effecting progressive change in the industry, OIF represents the dynamic ecosystem of 100+ industry leading network operators, system vendors, component vendors and test equipment vendors, all collaborating to develop interoperable electrical, optical and control solutions that directly impact the industry’s ecosystem and facilitate global connectivity in the open network world. Connect with OIF at @OIForum, on LinkedIn and at https://www.oiforum.com/. 112G serial links have moved out of the lab and onto the exhibit floor. 56G ramps up while 28G goes mainstream. Last year at DesignCon 2018, we witnessed high-speed digital designs that moved past 56 Gbits/s (56G) and onto 112 Gbits/s (112G). This year, DesignCon 2019 brought numerous demonstrations of 112G as the connectors and cables caught up with the silicon. While still appearing in technical papers and panels, 112G has certainly moved into the exhibit hall. Meanwhile, 56G has matured and is now a complete ecosystem. When it comes to signal integrity and high-speed signals, transmission lengths certainly matter, especially with electrical signals over copper connections. Yes, optical transmission is an option, but nobody wants to pay for it. At a panel session on Jan. 31, OIF board president Nathan Tracy presented the table shown in Figure 1 that describes five OIF standards for different electrical transmission lengths. Given a rule of thumb of 0.1 dB/in./GHz of insertion loss (Figure 2), PCB traces of, say, 10 inches are simply too long. That’s where cables that jump over PCBs have become popular. Connectors for 112G took several forms at DesignCon, depending on the length of the transmission. For chip-to-chip or chip-to-module distances, sending 112G four-level pulse-amplitude modulation (PAM4) signals (28 GHz) over PCB traces results in excessive insertion loss. To get past that restriction, several connector companies have developed cable assemblies that jump over sections of boards. Fremont, Calif.—February 20, 2019 – Demonstrating how interoperability works get done, 13 OIF member companies will participate in live interoperability demos of the industry’s hottest technologies – 400ZR, Common Electrical I/O (CEI)-112G and Flex Ethernet (FlexE) – at OFC 2019 in San Diego, March 5-7, 2019. Amphenol, Cisco Systems, Credo Semiconductor (HK) LTD, Finisar, Inphi, Juniper Networks, Keysight Technologies, Molex, Spirent Communications, TE Connectivity, VIAVI Solutions, Xilinx and YAMAICHI ELECTRONICS will demonstrate the interoperability of their products and technologies in OIF’s booth, #6215. OIF’s 400ZR project is critical in facilitating the reduction of cost and complexity for high bandwidth data center interconnects and promoting interoperability among optical module manufacturers. Currently in progress, the project will result in an implementation agreement for 400G ZR and short-reach DWDM multi-vendor interoperability. The 400ZR demo consists of real-time Error Vector Magnitude measurements demonstrating the maturity of the methodology used for transmitter specifications. In addition, a hardware-based 400ZR installation will show how participants communicate a typical application case. OIF is taking a lead role in moving the industry to the next generation with its development of electrical interface specifications for 112 Gbps per differential pair. Multiple live demonstrations featuring interoperability clearly prove the key role OIF provides. The CEI-112G demonstrations in the OIF booth will feature multi-party silicon supplier interoperability over mated compliance board channels and direct attach copper cable channels, all demonstrating the technical viability of 112 Gbps operation, along with multiple industry form factors including OSFP and QSFP-DD. OIF continues to lead in FlexE aggregation architectures through its newest FlexE 2.1 project for FlexE over 50GbE PHY applications, an extension to its FlexE 2.0 Implementation Agreement (IA). The FlexE 2.0 demo will show off the bonding, subrating, and channelization features that allows FlexE-enabled hardware to support non-standard Ethernet rates over standard Ethernet optics. Realistic multi-vendor deployment scenarios, client rate reconfiguration, and in-band messaging features will be demonstrated on a network built from a variety of Ethernet optics and interconnecting the OIF and Ethernet Alliance booths. On Thursday, March 7, industry experts from OIF will lead panels focused on the latest update on 400ZR specifications and the drivers, needs, and challenges in the evolution to widescale adoption of open, interoperable optical networks. Fremont, Calif.—January 23, 2019 – A panel of OIF experts will present and discuss the ongoing, multi-faceted Common Electrical I/O (CEI)-112G interface effort at this year’s DesignCon being held in Santa Clara, CA January 29-31. “112-Gbps Electrical Interface: An OIF Update on CEI-112G,” is scheduled for Thursday, January 31 at 3:45 pm (local) and will provide an update on the multiple interfaces being deﬁned by OIF including CEI-112G MCM, XSR, VSR, MR and LR. Applications of these 112 Gb/s interfaces include die-to-die, chip-to-module, chip-to-chip and long reach over backplane and cables. Panel speakers include Brian Holden of Kandou Bus and OIF member; Cathy Liu of Broadcom Inc. and OIF Board Member; Steve Sekel of Keysight Technologies and OIF PLL Interoperability Working Group Chair and Nathan Tracy of TE Connectivity and OIF President. Since 2000, OIF has deﬁned Interoperability Agreements (IA)s for electrical interconnects known as CEI. CEI is a clause-based document that defines implementation details for interoperable electrical channels initially issued for 6 Gbps, then 11, 28, and 56 and includes definitions for multiple channel implementation topologies and will soon include 112 Gbps clauses. In August of 2016, OIF announced the ﬁrst CEI-112G project in an overall effort that has now expanded to ﬁve projects. The CEI-112G IA effort is challenging in signal integrity, implementation complexity and measurement terms. The signals are increasingly vulnerable to channel discontinuities, leading to signal impairment and crosstalk. The switching speed and the density of the available SerDes transistors have not kept pace with other silicon functions, resulting in architectural challenges. Finally, the ability to probe and repeatably capture measurements at these rates with sufﬁcient accuracy and precision is challenging. Check the status of OIF’s current work in CEI-112G here. OIF is where the optical networking industry’s interoperability work gets done. Celebrating 20 years of effecting progressive change in the industry, OIF represents the dynamic ecosystem of 100+ industry leading network operators, system vendors, component vendors and test equipment vendors, all collaborating to develop interoperable electrical, optical and control solutions that directly impact the industry’s ecosystem and facilitate global connectivity in the open network world. Connect with OIF at @OIForum, on LinkedIn and at http://www.oiforum.com. 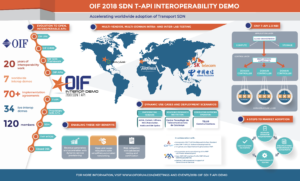 Webinar in partnership with Lightwave to feature OIF global multi-vendor interop demonstration results for SDN T-API use cases Fremont, Calif.—November 15, 2018 – Reinforcing its work to speed the implementation and commercialization of software-defined networking (SDN), OIF announced the launch of its newest project — “Requirements for Integrated Packet Optical SDN.” The project outlines requirements for a multi-layer SDN reference architecture as a use case for packet optical transport networks. This work continues OIF’s lead in FlexE aggregation architectures by keeping current with industry PHY rates Fremont, Calif.—December 4, 2018 – OIF, the global industry forum accelerating market adoption of advanced interoperable optical networking solutions, today announced the launch of the FlexE 2.1 project and newly elected board members and working group chairs. The new project initiation and elections took place at the Q418 Technical and MA&E Committee meetings held October 29-November 2, 2018 in Sydney, Australia. This work continues OIF’s lead in FlexE aggregation architectures by keeping current with industry PHY rates Fremont, Calif.—December 4, 2018 – OIF, the global industry forum accelerating market adoption of advanced interoperable optical networking solutions, today announced the launch of the FlexE 2.1 project and newly elected board members and working group chairs. The new project initiation and elections took place at the Q418 Technical and MA&E Committee meetings held October 29-November 2, 2018 in Sydney, Australia. Fremont, Calif.—August 7, 2018 – Detailed results from the OIF’s (Optical Internetworking Forum) 2018 Software-Defined Networking (SDN) Transport Application Programming Interface (T-API) multi-vendor interoperability demonstration showcasing new dynamic behavior use cases and deployment scenarios are available in a white paper published today. To request a copy, please go here. Demo results were initially announced at a public read-out at NGON in Nice, France, and at two invitation-only events earlier this month at CenturyLink and China Telecom. An additional read-out was held last week during MEF’s Annual Meeting in Nashville, Tenn. The API allows for some variability in the use of topology abstraction depending on business requirements and technology; documentation of supplementary examples for topology abstraction will help application and orchestration software developers. 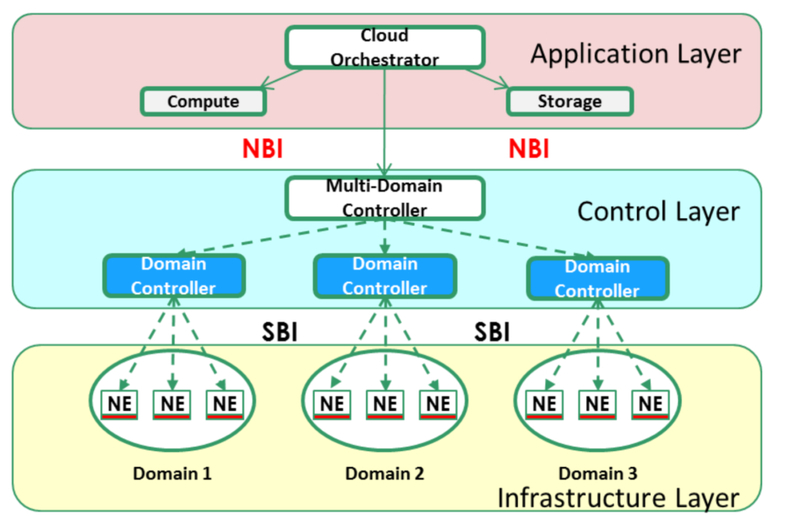 The multi-vendor demo led by four network operator labs included lab-deployed and cloud-deployed systems testing new dynamic behavior use cases and deployment scenarios. The demo also incorporated service provisioning scenarios at the LSO Presto reference point in the MEF LSO architecture, using the MEF NRP Interface Profile Specification (MEF 60), which defines extensions to T-API in support of Carrier Ethernet services. The multi-vendor demo includes testing new dynamic behavior use cases and deployment scenarios by network operators CenturyLink, China Telecom, SK Telecom and Telefónica. Participating vendors include ADVA, Coriant, Infinera, NEC/Netcracker, Nokia and SM Optics. Centre Tecnològic Telecomunicacions Catalunya is the participating academic and/or research institution and TELUS Communications is participating as a consulting network operator. This year’s demo incorporates service provisioning scenarios at the LSO Presto reference point in the MEF LSO architecture, using the MEF NRP Interface Profile Specification (MEF 60), which defines T-API extensions in support of Carrier Ethernet services. “The OIF multi-vendor interop testing is particularly important to Telefónica’s network transformation. We are anxious to validate T-API as the standard NBI for Transport SDN and announce the results in June,” said Juan Pedro Fernández Palacios, Telefónica. The results of the demo will be presented during a featured workshop and keynote presentation at NGON & DCI Europe 2018, the world’s leading strategic and technical optical networks event being held in Nice, France, and during two private events at participating network operator labs. Optical Masterclass: Speakers will discuss how OIF is assuring interoperability in open, agile next generation optical networks and present updates on critical projects including CEI-56G and CEI-112G, FlexE 2.0, 400ZR and Transport SDN. Additionally, Palacios, Head of Unit at Telefónica, will discuss the demo results and present use cases during his keynote presentation – Transport API: Standardization status, interoperability tests and use cases – on June 27th at NGON. Two invitation-only read-out events will be held in July. CenturyLink will hold a private read-out event on July 10 in Denver, Colorado and China Telecom will host a private read-out in Beijing on July 19. Members of the media and analyst community interested in attending, please contact leah@wilkinson.associates. SAN DIEGO – March 8, 2018 – Industry leading organizations, the Optical Internetworking Forum(OIF) and the Ethernet Alliance, today announced an interoperating 400 Gbps Ethernet (400 GbE) network demonstration at OFC in San Diego, CA, March 13-15, 2018. The joint demonstration will feature 400 Gbps of Flex Ethernet (FlexE) traffic sent over four bonded 100 GbE interfaces streaming over the Ethernet Alliance 400 GbE network and interconnecting the OIF and Ethernet Alliance booths on the exhibit floor. The demonstration is designed to showcase the Ethernet Alliance’s IEEE 802.3bs 400 Gbps technology recently ratified in December 2017 and the OIF’s FlexE 1.1 Implementation Agreement (IA). Furthering its mission to promote the development and deployment of interoperable networking solutions and services, the OIF will showcase a variety of projects, including an industry-first, during OFC. The OIF booth, host to 14 member companies, will feature five separate, multi-party, demonstrations featuring device and component interoperability. Two FlexE demos will showcase the bonding, subrating and channelization capabilities of the released FlexE 1.1 IA. Separately, a high speed electrical demo will feature the OIF’s recently released CEI-4.0 56 Gbps PAM4 VSR (chip to module) electrical interface in a configuration that includes electrical to optical to electrical operation. Finally, two additional demos will feature 112 Gbps serial (single channel) electrical signaling in a VSR (chip to module) application and a direct attach copper cable implementation. The next Ethernet era is underway, and the Ethernet Alliance OFC 2018 multivendor technology demonstration is one of the many steps the Ethernet Alliance is making in support of interoperable, next-generation technologies, such as PAM4. The demo showcases technologies from copper to optical interconnects at rates of 10 GbE to 400 GbE, as well as a live 400 GbE network. This OFC 2018 demonstration illustrates the innovations that can happen when you have the whole of the Ethernet ecosystem fully committed to bringing tomorrow’s networks to life today. Happening in booth #2648, the Ethernet Alliance’s OFC 2018 demo incorporates equipment and solutions from 17 different companies: Amphenol Corporation (NYSE: APH); Anritsu Company (TSE:6754); Arista Networks, Inc. (NYSE: ANET); Cisco Systems, Inc. (NASDAQ: CSCO); Commscope Holding Company, Inc. (NASDAQ: COMM); EXFO, Inc. (NASDAQ: EXFO); Finisar (NASDAQ: FNSR); Huawei Technologies Co.,Ltd. ; Keysight Technologies (NYSE: KEYS); Juniper Networks; Molex, LLC; Nexans S.A. (EPA: NEX); Source Photonics, Inc.; Spirent Communications (LSE: SPT.L); TE Connectivity Ltd. (NYSE: TEL); Teledyne LeCroy, Inc. (NYSE: TDY); and Xilinx, Inc. (NASDAQ: XLNX). The Optical Internetworking Forum (OIF) today released the public multi-vendor interoperability demonstrations that it will conduct at Booth #5525 at OFC in San Diego, March 13-15, 2018. The demos will showcase three significant technologies; Flex Ethernet (FlexE), 112 Gbps per lane live electrical signaling and end-to-end optical links using CEI-56G-VSR electrical interfaces. In addition to the live demonstrations, OIF industry experts will conduct two panel discussions at OFC. There are 14 participating companies including Amphenol, Credo Semiconductor, Fiberhome Telecommunications Technologies Co., Ltd., Finisar, Huawei Technologies Co., Inphi, Keysight Technologies, Molex, TE Connectivity, Tektronix, VIAVI Solutions, Xilinx, Yamaichi Electronics, and ZTE Corporation. The FlexE technology from the OIF extends standard Ethernet with bonding, subrating, and channelization features and is defined in the FlexE v1.0 Implementation Agreement. The demo features interoperability among member companies using combinations of these three features over multiple types of 100 GbE. This demo features multiple silicon suppliers operating over a 56 Gbps PAM4 VSR (chip to module) link reflecting the recently published CEI 4.0 document that includes this 56 Gbps PAM4 channel definition. The 56 Gbps demo will electrically drive interoperating optical modules, interconnected with fiber, showing a full multi-vendor electrical-optical-electrical link from host-to-host. The broad range of technologies and suppliers participating in the demo indicates the maturing industry ecosystem around 56 Gbps signaling. The OIF recently began new projects to define 112 Gbps per lane interoperable serial electrical channel definitions. As part of that effort, the OIF will be presenting two 112 Gbps serial electrical demos at OFC 2018. The first demo will include a silicon chip driving a VSR (chip to module) channel and the second will have a silicon chip driving a direct attach copper cable assembly. 112 Gbps electrical signaling is regarded as a necessary technology to enable future signaling bandwidth requirements.